Madwoman pizza, originally uploaded by shaunaforce. When I was a kid, pizza brought a certain set of sense memories: small round pepperoni slices, curled up at the edges, orange oil pooled in each one, crowded together on a thin layer of cheese. Mostly, we ate frozen pizza when I was growing up. Cardboard-tasting crusts. Toppings that refused to move, even when we bit down on them. Runty and unsatisfying simulacrums of the pizza I knew must be possible in the world, even if I had never eaten it. The best evenings were when we found out we were going to Shakey’s pizza, for sizzling-hot pizzas delivered to our table, with the sound of pinball machines -- and later Ms. Pac Man and Frogger -- surrounding us as we ate. Maybe we had just finished a big soccer game, or my parents couldn’t stand another night in the house. Either way, I was happy. Thin crust that crackled when I bit it, slightly burnt at the edges. Those stamped-out pepperonis. Or little greasy crumbles of sausage, evenly brown, filled with fat. I seem to remember my brother going through a period when he would only eat plain cheese pizza -- was this also when he would only wear beige clothing or khaki pants? -- so I ate my fair share of that. Later, we moved up to Round Table pizza, where the crust was far more doughy, and we graduated to green peppers or Canadian bacon and pineapple for toppings, and ordered from menus with vaguely Arthurian themes. If we worked at it, we’d save a few pieces to take home, to eat cold for breakfast the next morning, all the salt pooled at the top, the cheese congealed into a hard mass, the pepperonis curled up almost entirely into themselves -- and all was right with the world for a few moments. How exciting to open that massive cardboard box and see the smear of tomato sauce and the bits of cheese sticking to the top. It didn’t seem to matter just how bad the pizza was. I just loved the cheesy goodness. Eventually, I did have to draw the line at the pizza from the lunch room at my high school, which came in soggy squares and so much oil on the top that we had to wipe it off with paper napkins, which immediately became transparent from the amount of fat they soaked up. This is the place that also served us french fries so greasy we could actually wring them out like dishcloths. No wonder I ate a Yoplait yogurt and an It’s It bar for lunch every day of my senior year. Still, I loved pizza. When I grew into adulthood, I ate increasingly great pizzas. And some were deeply memorable. Like the thin-crust, hot-from-the-oven slice I ate in Florence, Italy, just off the Piazza Santa della Croce. I was there alone for the weekend, not knowing a word of Italian, in the middle of February, when there were no other tourists. I didn’t speak to anyone for three days, which was like a lonely meditation retreat in the middle of Italy. But I could point to a slice and smile. 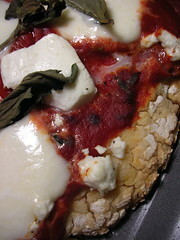 This slice restored me to myself: the bite of the garlic; the supple depth of the tomato sauce; the fresh mozzarella better than any I had ever tasted. I sat at a table by myself, outside the cafe, waiting for a hail storm to stop, looking out over the piazza, eating my pizza, utterly at peace. Finally, there were the thousand gorgeous slices of pizza I have eaten at Sal and Carmine’s, on 101st and Broadway, just across the street from my apartment building in Manhattan. Coming home after a long day of exploring, writing, and gallivanting, I’d emerge from the subway at 103rd. If the air biting at my hands and cheeks was particularly cruel, I’d have to stop in for a hot slice before I ducked into my building and ascended the elevator to my apartment. A long sliver of a store, with little-to-no decoration, Sal and Carmine’s was only there to sell pizzas. Slices, mostly. I’d order one (or two) cheese slices and wait. With this pizza, I was perfectly content with merely cheese. This was no beige pizza. Sal (or Carmine; I couldn’t keep them straight) grunted hello, then turned toward the large ovens, and expertly slid out my slice and slipped it onto a white paper plate. He’d smack the brown paper bag with a flick of his wrist, for clearly the five thousandth time, and it would make a satisfying “pop” as it opened to the room. Then, he’d slide in my slice and hand it to me. I’d open the bag again to sprinkle hot peppers all over it, and throw in a couple of napkins. He’d slide me a Dr. Brown’s root beer, and I’d wave goodbye. Sometimes, I’d even wait until I’d crossed the street before I’d take a bite. But most of the time, I’d walk across Broadway with an enormous slice of pizza, folded over, hovering above my mouth. When I first out I couldn’t eat gluten, I knew that I’d be fine, because I didn’t want to be that sick, ever again. But what about pizza? I thought I’d just never eat it again. But I don’t give up that easily. I’ve been experimenting with gluten-free pizza crusts lately, and I’m starting to sing with them. By no means am I done with my recipe yet -- you can expect updates in the months to come -- but the one I made last week that tasted authentically itself. Slightly nutty, from the quinoa flour. Thick and chewy, with a dense crunch. And the perfect repository for chunks of mozzarella, with fresh basil. Ah, another good pizza memory. Lately, I find myself eating more crusty, bready, starchy foods than I have in months. It’s winter. It’s January, in particular. The dead, mid-winter month of the year. And this week, I’ve been run off my feet, so busy with projects and people and work that I haven’t posted here in days. This evening, once again, I found myself with only an hour at home before I had to head out again. (Soon, this will stop. It’s no way to live.) No chance to cook, and especially to make something up. So I did something I hadn’t done in years: I ate a frozen pizza, reheated in the oven. Before you panic, I have to tell you, it was gluten-free. I don’t write about this much, but I’ve been receiving a lot of gluten-free foods in the mail. Large companies and small businesses read this site, then send me samples of gluten-free foods, hoping I’ll like them. Sometimes I do. Most often, I don’t. I’m picky. I insist that food taste like food. A few times, I’ve wondered if the foods were truly gluten-free, because I got a little sick after eating them. I don’t mention those here. I don’t write about free products, unless I like them. But I do like these little gluten-free frozen pizzas I ate tonight. Made by Madwoman Foods (and you have to love that name), these pizzas are made from organic ingredients, the freshest foods, then shipped out with a little cold pack inside. And they’re great. They taste like real cheese, fresh spices, a rush of old pizza memories coming back. And they weren’t the memories of frozen pizza from when I was a kid. I recommend them to you. And the little tea cakes they make, to which I’ve grown a little addicted, especially the chocolate orange cakes. These are especially good, and made with ghee, so people who are lactose intolerant could have these cakes as well. I love supporting small companies who are trying to do right in the world. I hope you do too. With rustic quinoa crusts, and even the convenience of an occasional frozen one, pizza doesn’t have to be forgotten by those of us who eat gluten-free. Really, how could it? Instead, I’m moving on, with a mind full of memories, and the persistence of invention, until I’ve perfected my own, favorite gluten-free pizza crust. Eventually, those mouths full of basil and spicy sauce will join the memories of Florence and Chicago and the median on 101st in the darkness. I’ll no longer think of it as only gluten-free pizza. Eventually, it will just become pizza. 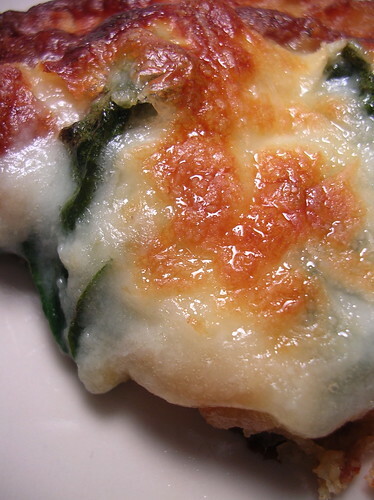 This recipe comes with a warning: this will not taste like a typical pizza crust. Gluten-free foods will never replace the glutened foods we once knew. They will always taste different. Maybe even better. With that in mind, I've concocted this one, with quinoa flour. Quinoa flour has a distinct taste: slightly nutty, ever present. It doesn't blend in with the other voices; it sings out. Also, the texture is thick, crunchy on the top, much more bready than most typically thin pizza crusts. I like that. I want a gluten-free crust with heft. But if you wanted something thinner, more demure, try a different flour combination, a little cider vinegar, maybe even some egg whites. Experiment and try your own, then let me know what works for you. Half an hour before you want to make the pizza dough, pour one packet of quick-rising yeast into the lukewarm water, then stir in the sugar. Gently, stir the mixture together, then let the bowl (or measuring cup) rest on a warmed surface, such as the stove when the oven is on. Let this rest for half an hour or so, or until the yeast mixture has grown bubbly and swollen. Roll out the dough with a rolling pin, on a gluten-free-floured surface. Transfer it to a baking sheet and slide it into a 400° oven for eight minutes or so. You want the crust to feel slightly hardened, tending toward crispness. Top with your favorite pizza sauce and toppings, then slide it all into the oven again, for another ten minutes or so, or until the cheese has melted and the sauce crusty and bubbling. Wow. Thanks for that wonderful walk down pizza memory lane. True pizza is on my top 3 list of most missed foods (along with real bread and pasta). Back before 1998, when wheat just stopped working for me, I was the pizza-man, making my own crusts, sauce and topping every Sunday night for my family. For years, I was simply too bitter about the loss to even try imitation crusts. My wife bought some of those frozen rice crusts for me, just so she could still serve pizza and have something for me, but the experience was like eating wonderful toppings on cardboard. Thanks for the recipe. I'll give it a shot. Pizza is a perfect food. The gooey cheese, the mixture of toppings, but most of all the crust. It's my favorite part. Thanks for sharing your memories and sparking a few of my own. One outstanding pizza was the authentic Neopolitan tuna pizza we had in Sydney, Australia. Crispy thin crust, minimal ingredients. Perfection. That looks really yummy. I am impressed with your determination to still have the foods you use to love with an adapted twist. Thanks for sharing! What a fantastic coincidence! I'm planning a trip to Rome, so I have pizza on the brain (in a sad way). Just yesterday I thought, I should try to make my own gf pizza, and wouldn't that be easier if Shauna would try it first and post a recipe for me. Et voila. Thank you. So, my dear, during my NYC visit last weekend, Brandon and I set out to try this Sal and Carmine's slice you've told me so much about. I had looked it up; I had an address; and I had your sterling, salivation-inspiring recommendation...but we couldn't find it! Help! Could it have closed? Brandon is eager to try a slice, so any pointers would be greatly appreciated. Mmm, your gluten free pizza looks divine, especially with those big, fat chunks of fresh mozzerella. Ms. Pac man, Frogger and pizza - brings back lots of memories for me! As does ringing out the fries and patting down my school pizza with a napkin too, unfortunately! Here's to hoping for better for kids in the future! Your pizza-in-Florence story reminded me of all the great pizza my sister and I ate in Italy--it revolutionized my idea of what pizza could be. My first Italian pizza was on the night we got to Rome--we went to a tiny restaurant with only one waiter and one cook and ordered by chance and hope and got a classic pizza called Quatro Stagione (not sure of spelling) which is divided into 4 quarters, each with a different topping. A revelatory dinner! Later the same week, we had gnocci there for the first time--another prime food experience. Also wanted to say that although I'm not gluten-intolerant, your site has inspired me to start using other kinds of flours and grains, much to my gustatory delight. Very nice picture and inspiring recipe. And you are right, I myself have always hated not to have the time to cook when to busy. But you know what I do for those times? I cook soups that I can always reheat. With salads and just simple smoked salmon, cheese. Soups are your best friend for those hectic times! Ha ha. Similar memories: Shakey's, then graduating to Round Table (which I actually still appreciate, even though I can get pizza at Chez Panisse and Cafe Zuni). Good for you, Shauna, for not giving up. If I had celiac disease, I'd probably just go on some lonely, sad, all-yam diet or something. Congratulations, my dear, on your hot-off-the-press win in the Food Blog Awards! I didn't have any doubt, naturally, but I'm still thrilled to bits for you! Congratulations on your Food Blog award. Truly well deserved! This blog is a great thing for people with gluten intolerance, just like you! Hey Shauna...congrats on the Food Blog Award...highly deserved! CONGRATULATIONS, Shauna! Well, well deserved. The place is amazing...no other words to describe it. *I know this post was created several years ago* It is now autumn 2010, and sadly Madwoman is closing. I too loved their pizza crusts! Several restaurants in Minneapolis and St. Paul were purchasing their crust from Cooqi (another GF bakery that closed) and Madwoman. So sad! But thank you for loving a great MN bakery! We love your recipes and your book!